As a student in the ‘60s I learnt that the two basic principles of the Welfare State were: “a job when one can work, and an income when one cannot work". The Beveridge Report which was written in 1942 and introduced in 1945 aimed to provide a system of social insurance "from cradle to grave". All working people paid a weekly contribution and in return benefits would be paid to the unemployed, the sick, the retired and the widowed. Beveridge wanted to ensure there was a minimum standard of living in Britain below which nobody fell. Those who now criticise Beveridge argue that the welfare state has encouraged a dependency which is no longer affordable and during a time of austerity the Welfare State is no longer able to provide a safety net for those going through difficult times. However, people become desperate for all sorts of reasons which are often beyond their own control. The Trussell Trust (www.trusselltrust.org), which is the organisation supporting the development of food banks, cites the following as the main reasons why people need emergency supplies of food: Changes in benefit 11.47%, Benefit delay 29.59%, Children's Holiday Meals 1.21%, Debt 9.10%, Delayed Wages 0.82%, Domestic Violence 2.73%, Homelessness 4.93%, low lncome 19.46%, Refused Crisis Loan 3.59%, Sickness 2.24% Unemployment 5.57%, Other 9.30%. 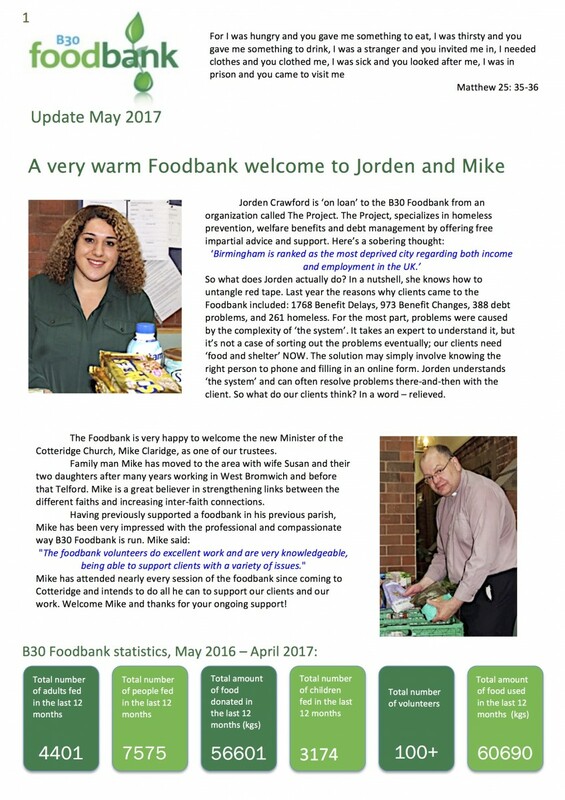 Cotteridge Church believes that setting up and supporting a food bank is one further way in which we can support those in need in our community. The principle of a food bank is that people are encouraged to make donations of food, whether via a stall outside a supermarket which asks shoppers to make an additional purchase, by donating food directly through organisations such as schools, businesses and churches, or by providing financial support with which food can be purchased. Every client in need is referred to the foodbank by a frontline care professional such as a doctor or social worker. In order to prevent dependency on foodbanks our clients have a limited entitlement to three foodbank vouchers. 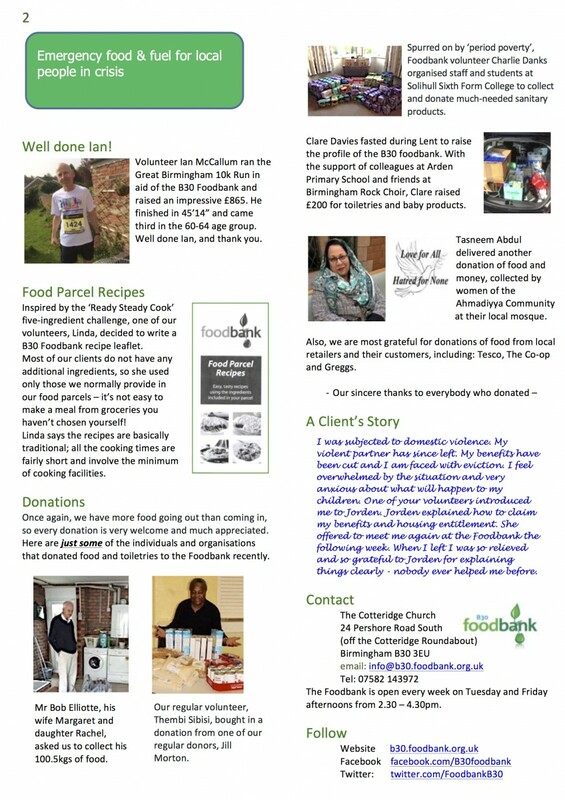 Foodbanks are run by the community for the community, providing an emergency food service. Volunteers of all backgrounds help run foodbanks by packing, sorting and distributing the food or chatting to clients. This means that the food bank has roles for a wide variety of people. Also you can download the previous version of the newsletter.